John Kenneth Muir's Reflections on Cult Movies and Classic TV: Fireball XL5 (1962 - 1963): "Planet 46"
In “Planet 46” the inaugural episode of Gerry Anderson’s Supermarionation series Fireball XL5 (1962-1963) Space City’s World Patrol Headquarters and Commander Zero detect a missile approaching Earth. Worse, it carries a “plan-a-tomic bomb,” a weapon capable to causing damage on a planetary scale. 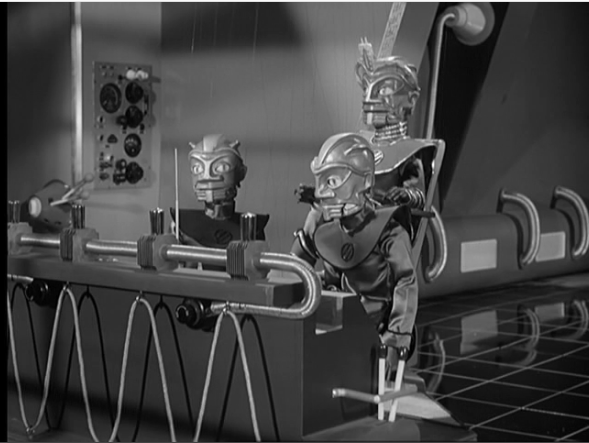 In space sector 25, Steve Zodiac, Robert the Robot and the rest of Fireball’s crew divert to intercept the missile. They explode it using radio-waves and trace its source to the mysterious Planet 46. The ship heads to that planet, and Venus and Steve head out on their jet mobiles to explore the barren world, where no signs of life have been detected. Before long, they spot a door in the side of a mountain, and a secret base inside. The aliens who dwell there, the Subterrans, are planning to launch a second attack. The aliens capture Steve and Venus, and launch a second deadly missile…this time trapping Venus aboard the speeding craft! Both stories involve villains with secret bases, captured heroes, and weapons of mass destruction lobbed at a heavily-populated area. Both stories end with a pursuit (and the destruction of) a missile. Accordingly, “Planet 46” is not a particularly original or scintillating half-hour. 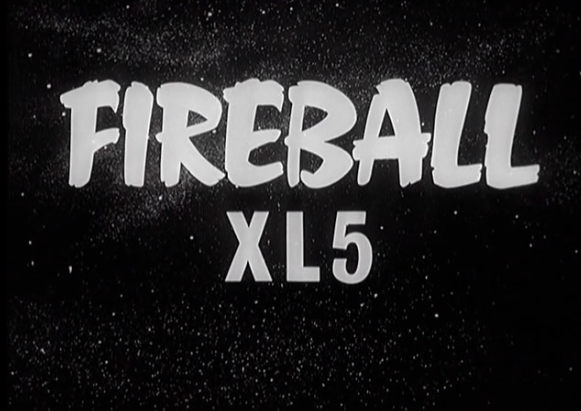 Later episodes of Fireball XL5 (including the one I will look at on Wednesday: “Flight to Danger”) are much stronger in terms of character development and storytelling than is this debut. It’s ridiculous to judge a series made more than fifty years ago by today’s social standards, and yet by the same token it’s impossible to notice how poorly Venus is treated here compared to the male characters. She is a brilliant doctor and astronaut, and serves ably on landing party missions, and yet twice she is asked to make coffee for Steve Zodiac. It’s such a strange dichotomy. The creators of the series knew that in the space age, female officers would fly spaceships and prove invaluable members of a team…and then they had them still acting according to 1960s sexist behaviors…like fetching coffee. Two giant steps forward for woman, one step back for woman-kind. In the works of Gerry Anderson, this problem abated in the 1970s. UFO posited (two) female commanders of Moonbase and in Space:1999 Dr. Helena Russell and Maya were both crucial motivators in terms of the series’ action. But Fireball XL5 is an early point in that evolution. “Unlike Earthman, we do not make mistakes!” declares the alien. “That’s what you think!” Steve answers. This same line of dialogue has been used on every Filmation superhero series since time immemorial. It’s so…trite. Not to mention lame. 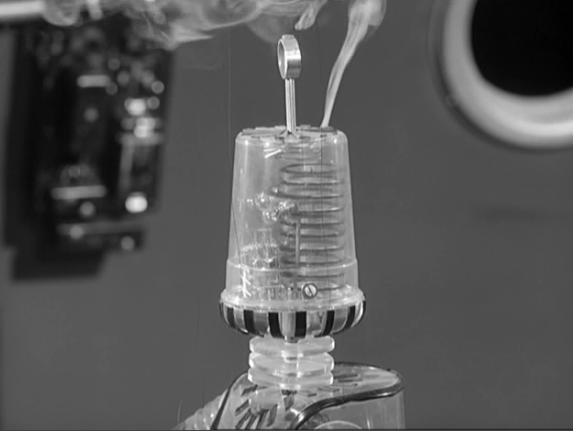 But again, Fireball XL5 is clearly getting its space legs, and so it’s no wonder that the first episode is a bit wobbly. 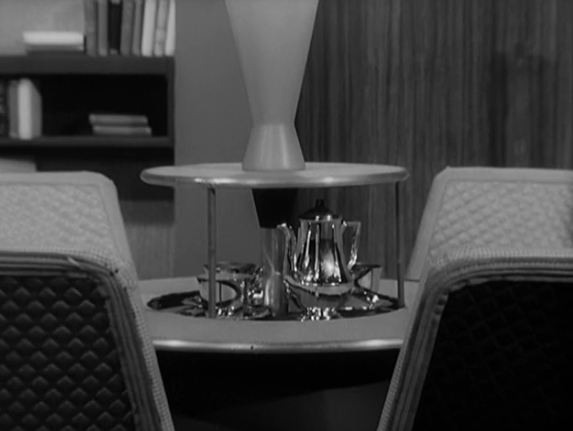 “Planet 46” also features some nice, not to mention idiosyncratic, touches worthy of mention. I liked the alien “coma ray” which puts enemies to sleep. In this case, that means that the puppet characters literally go limp before your eyes. Finally, Robert’s agitation about making a mistake is accompanied by jets of steam shooting out of his ears. That’s weird…but original and memorable. 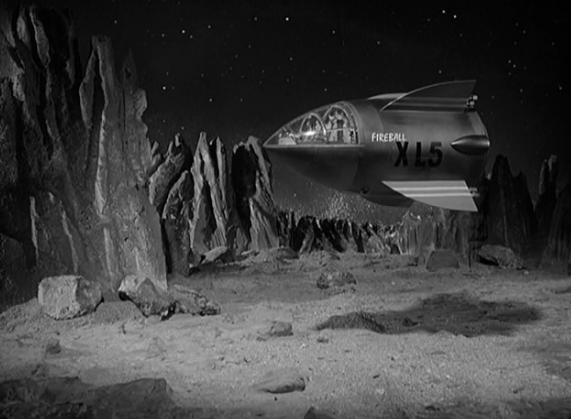 I prefer Fireball XL5 to Supercar in part because I love the design and capabilities of the titular ship, but I also really enjoy the series’ storytelling when it is going full thrusters. When Fireball XL5 operates outside the standard evil-alien-wants-to-destroy-Earth-with-terrible-weapon paradigm on display here, it’s really a lot of fun.